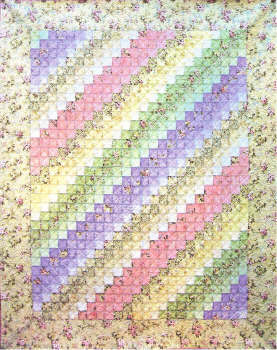 This sweet quilt uses 24 - 2.5" strips for the small size or 48 strips for the larger size. Purchase a "jelly roll" of 2.5" wide strips or cut your own from 24 different fabrics! Very simple to make with professional results. Finished sizes are: 56" x 64" and 64" x 80".